Ries' Pieces: Building a new restaurant brand. Building a new restaurant brand. Seasons 52: A case study. A new restaurant brand has hit the market, Seasons 52, and it looks likely to become the next big thing in white table cloth dining. The first Seasons 52 opened in February 2003 in Orlando, Florida. Last year, two Seasons 52 restaurants opened here in Metro Atlanta. The Seasons 52 brand is red-hot. Thousands of restaurant brands are launched each year. Most fail. Not usually because of lousy food, but because of lousy branding. Why is Seasons 52 likely to be a winner? And how can you use the lessons learned for your brand? Read on for my six reasons why. Most brands want to attract as many potential customers as possible, so they position themselves as broadly as possible. This is the biggest mistake you can make in branding. Brands are built by having a narrow focus. With restaurants, one signature dish can often build a brand. The dish doesn’t have to be the only thing on the menu, but many times it wouldn’t hurt. Think Chipolte and burritos. What is Seasons 52’s narrow position? A lighter, healthier approach to dining. Most high-end restaurants serve rich, high-calorie food usually in large portions. Many French people are horrified by how much food is served in a typical U.S. French restaurant. If you’re watching your waistline, like most Americans are or should be, eating out is tough. You can be a special request nag with all sorts of demands for no sauce, only steam cooking, no potatoes and half your dinner in a doggy bag. But that is no fun and usually leaves you with a tatesless dinner. Or you can treat dining at one of these restaurants as your cheat day. But that limits how often you visit and how healthy they feel after visiting. One meal can undo a weeks worth of good intensions. Seasons 52 did the opposite. A high-end restaurant serving fresh, healthy food in reasonable portions. Having a name that locks your position in the mind is very effective in building a brand. Subway and Submarine sandwiches. Blockbuster and video rentals. Olive Garden and Italian food. Using a word out of context to reinforce your position can be powerful. It links your brand name with your position in the mind. It helps people remember who you are and what you stand for. And it helps with word-of-mouth by making your concept easier to describe. The Seasons 52 link is not obvious at first but once you hear it you will not forget it. 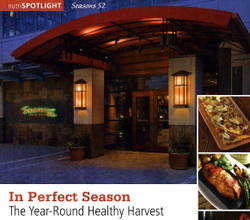 Seasons 52 offers the freshest foods of the season by changing its menu four times a year. The name also plays off the Four Seasons restaurant, a New York landmark in high-end dining. It would be even better if they changed the menu every week or 52 times a year. This would best reflect and reinforce the name and give people a reason to keep coming back week after week without getting bored. It is not enough to just say you are “healthy,” You need to do something to dramatize your position. Seasons 52 has a unique element that sets it apart from every other white-table-cloth restaurant. Every item on the menu is less than 475 calories. Wow! That is a bold move. And also brilliant because it clearly states the brand’s position. No stars on the menu for the diet food. Everything on the menu deserves a star because it is healthy and low in calories. Seasons 52 backs up its health claim by talking about how they grill or roast everything over an open flame. Making it low in fat and high in flavor. New brands need news value. PR is necessary to builds brands because it drives word-of-mouth. “Healthy” is the buzz word of the day. Magazines, television shows and websites are looking for healthy food stories. Most restaurants just talk about their delicious food and great atmospheres. There is nothing new or news-worthy about being delicious. Delicious is also very subjective. Less than 475 calories for everything on the menu is specific and news-worthy. No one can argue about that. And it is definitely new and different. Not all successful brands are built on a totally new idea. Many just borrow what has worked in one category and use it in another. PowerBar was an energy bar. So Red Bull launched an energy drink. Healthy is certainly not a new idea in food. Subway built one of the leading fast-food restaurant chains by focusing on health. Fresh and healthy. The low-fat sandwiches and Jared’s weight-loss from eating at Subway brilliantly reinforced this position. Seasons 52 is doing at the high end what Subway did at the low end. The most successful branders are not always the ones who conjure up the new ideas but the ones who can recognize a good idea and use it to build a brand. Seasons 52 has the position, the difference, the PR potential all working in its favor to build a potentially powerful global brand. Darden, the owners of Red Lobster and Olive Garden, have done it again with their latest brand, Seasons 52. Almost all brands start slow. So I am not worried about the slow initial growth rate. Red Bull took 9 years to reach $100 million in sales. And today (20 years later) they are over $3 billion. Coke would never have had the patience for the brand. Only now do they realize the mistake. And it is too late. By far the biggest violation comes from brands not sticking to a narrow focus. The restaurant brands in trouble today like Applebee's, Chili's and Friday's all suffer from trying to appeal to everybody. Now that they face focused competition they are in trouble. And could become the now extinct coffee shop of the future. The only problem with Seasons 52 is their rate of store openings. Since the first year (2003) I think they've opened only four restaurants in four years. It appears Darden is not nearly as confident as you about the brands success. I'm from Canada where we laugh at chains like Olive Garden and Red Lobster whose formulas are little more than McDonald's gone upscale. Seasons 52 has some pizazz and I don't think they (Darden) know what to do with something of such quality. Great analysis. It does seem, however, that they failed your name test. Maybe something that played on the 475 calories would have been more appropriate. I really should steer clear of your blog around lunchtime. Great post. My question to you is: of the six items you discussed above, which one item do you see violated by brands the most? I’m just curious about your opinion. Thank you for the clarity and simplicity of such an important marketing project. I have sent it to the other board members of the venture backed startup I am coaching. It is struggling with positioning in a new market. I wish I could articulate such a complex subject as well as you did! Please leave your comments in the proper post. Your iPhone comment has nothing to do with Seasons 52. And BTW, the jury's not out yet. Follow up with us next year. Great breakdown on Seasons 52, Laura. My money's on Darden too. you were so right about AAPL. This company is just crap. They should be more focused. The iPhone is just a hassle and distraction. I don't know why they developed such a crap.